Video fanatics are never short of YouTube clips, while for Apple zealots, they never stop seizing opportunities to get YouTube videos played on iPhone, iPad, iPod or make funny YouTube videos more stylish with video editors and players like Final Cut Pro, iMovie, QuickTime etc. Well, it sounds ridiculous to do such thing since YouTube videos are usually saved in FLV format which is regarded to be opposite to almost all Apple gadgets. As a result, many Mac users may wonder how to make YouTube videos compatible with Apple devices? To do this job, you'd better first and foremost convert YouTube videos to MOV, a popular format of the small size and good video effect that is fully acceptable by iPhone, iPad, iPod, Final Cut Pro, iMovie, etc. MacX Video Converter Pro - Download YouTube HD/4K UHD videos at fast speed and convert YouTube videos to MOV with no quality loss. A good tool for you to play YouTube videos on QuickTime player, iPhone, iPad, Apple TV without network connected. Why You Need to Convert YouTube to MOV Format? MOV is an MPEG4 video container file format used for saving movies and other video files by employing Apple's proprietary compression algorithm. MOV is similar to MP4 but the two are interchangeable. MP4 has better support while MOV is natively supported by Macintosh computers as well as all Apple devices. While videos on YouTube are usually saved in formats like FLV, MP4, WebM and 3GP. Even if you download a YouTube video in MP4, there may come with some playback error on iDevice due to the codec problem. But you can download YouTube videos to MOV as it is the preferred format by the iPhone, iPad, iPod, iTunes, Apple TV, etc. To get the job done, many people resort to online YouTube downloader, such as onlinevideoconverter to capture YouTube videos. But these online tools come with many restrictions and disadvantages, just take a look at how online YouTube downloader fight with offline YouTube converter software. 2. Download and transcode YouTube videos one by one. 3. Cannot convert local videos. 4. Risk to suffer from virus, adware, or malware. 3. Download online movies and even convert YouTube movies on computer. 4. 100% safe and clean. As is mentioned above, a video converter makes it possible to save YouTube videos in MOV on Mac. But which is the best YouTube to MOV converter on earth? 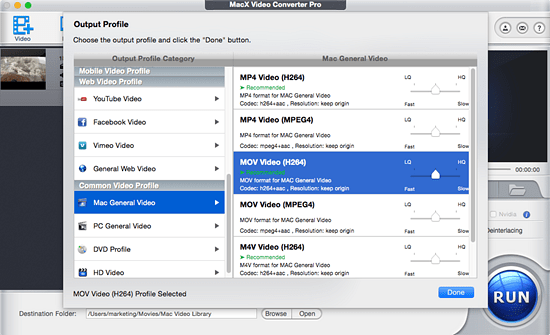 Here MacX Video Converter Pro can be your faithful lifesaver. With the stunning YouTube to MOV converting software for Mac (macOS Mojave supported) and PC (windows 10), it’s but the blink of an eye to download YouTube HD videos and convert them to MOV file format on Mac with highest quality. What’s more, this program is not only limited to seamless YouTube to MOV transcoding feature, but also displays its almighty function, enabling you to convert among SD and HD videos like MKV to AVI, WMV to MP4, MTS to MOV, MOD to FLV, AVI to MPEG, etc on Mac for later use. Free download and run this YouTube to MOV converter, you don't even need to download the YouTube video file to Mac or PC computer because it features a YouTube downloader. Click "YouTube" button, copy and paste the YouTub video URL to the type box. Just choose the video resolution, file size, codec and format as you want, tap OK, the rest video downloading job will be automatically done by this app. For the purpose of encoding YouTube videos to MOV on Mac, here choose "to MOV" as output format. Then you may use this program to download YouTube video to MOV format, so that you can play YouTube video on QuickTime, iPhone iPad iPod, edit funny clips with iMovie, Final Cut Pro, etc. Click "Browse" button to choose the path where you want to save the output files in. Hit the "RUN" button and start conversion of YouTube FLV video to MOV on macOS. All the tasks can be finished at 83x faster speed and high output quality. This YouTube to MOV Converter program also makes it easy to directly convert video to iPad, iPhone, iPod, Samsung, HTC, etc without the necessity of knowing the specific parameters and video format supported in advance. Therefore, you can play and watch high quality video on iPhone (iPhone 7/6S/6/Plus/5/4S/4/3GS), iPad, iPad 2, iPad 3/4, iPad Mini, iPod touch 5G/4G, iTunes, Apple TV, PS4, PSP, PDA, Blackberry, Nokia, Android, Zen anywhere anytime. How to Convert YouTube Video to MP4 format for playback on portable devices? This article shows you the simplest way to convert YouTube video (4K UHD included) to MP4 format on Mac, so that you can play your favorite YouTube videos as well as ultra HD videos with different players like iPad, iPod, iPhone etc. If you want to convert YouTube to MP3 on Mac a ringtone or extract audio MP3 from YouTube video, this tutorial will show you how to convert Youtube (48 or 60fps) to MP3 on Mac with a powerful free YouTube to MP3 converter. Want free YouTube music videos downloads in MP3, HD MP4 for playback on iPhone, iPad, Android? Here simple guide on free download music videos from YouTube in MP3, 4K UHD, HD with the the best YouTube music video downloader is shared. MacX Video Converter Pro is the best YouTube to MOV converter, which can easily convert YouTube FLV videos to QuickTime supported formats like MOV, MP4, M4V etc, along with excellent YouTube video download feature.